They perform routine tasks under the supervision of nursing and medical staff such as answer patients' call bells, deliver messages, serve meals, make beds, and help patients eat, dress, and bathe. Assistants may also provide skin care and take temperatures, pulse, respiration, and blood pressure. Nursing assistants help care for the physically or mentally ill, injured, disabled, or infirm individuals confined to hospitals, nursing, or residential care facilities and mental health settings. Our partnership with Northland Pioneer College allows you to earn high school credit from NAVIT and college credit from NPC. This course is taught by an NPC instructor who has had much experience in the nursing assistant field. Most importantly, NAVIT pays your tuition. The demand for nursing assistants is expected to increase steadily due to the numerous openings that will arise from a strong emphasis on rehabilitation and long-term care needs of a growing elderly population. 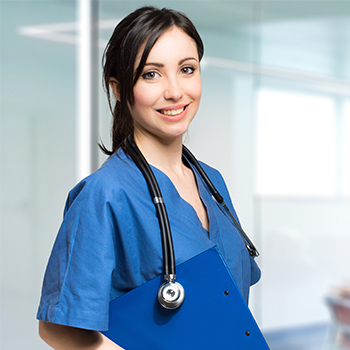 In addition, this course will help prepare you for additional training in nursing services. Upon completion of the program, students will be ready to take the state board exam for which they must pay.